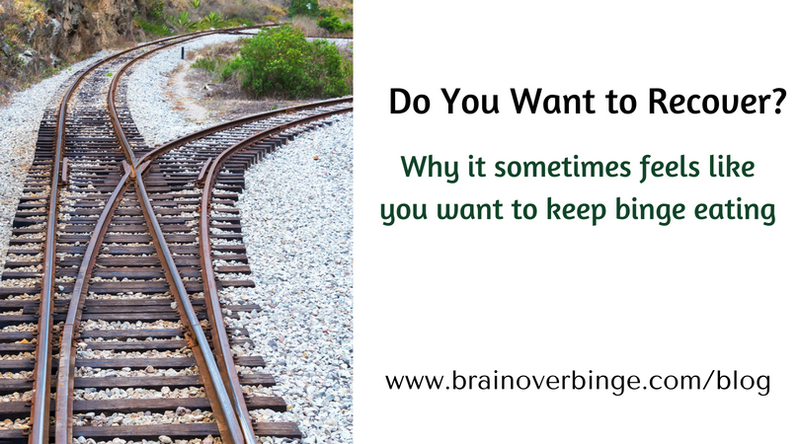 Since I wrote Brain over Binge, I’ve noticed that a common reason people give for continuing to binge is that they aren’t sure they really want to quit. Even though they may understand why they binge, even though they can recognize the irrational thoughts of the lower brain; they can’t quite convince themselves to ignore those thoughts, because they feel like they might not even want to recover. In Brain over Binge, I wrote my belief that the first step in recovery is wanting to recover (I think most therapists and coaches would agree). Nothing can help you until you have a desire to move away from the behaviors that are causing you pain. Others can educate you about the risks of the behaviors, they can help support you, they can give you tools to use for when you are ready; but until you decide that you no longer want binge eating in your life, you’ll continue down the same path. You have to want to turn off of your current path, and take a new path, and no one can make that decision for you. What Does Wanting to Recover Mean? Wanting to recover doesn’t mean you will be unwaveringly certain about it in every moment, especially when you first decide to stop binge eating. Wanting to recover doesn’t mean you’ll know what your life will be like after you end the habit, or that you know exactly what goals you’ll pursue, or that you’re sure you’ll enjoy every moment of your binge-free life. Wanting to recover simply means that, at least in some moments, you realize that you can’t continue down your current path; and in these moments of clarity, you want to move on. If you are reading this blog post, it’s almost certain that you do want to recover. I believe that anyone who is seeking recovery advice, or reading recovery material, or engaging in any form of treatment or coaching does indeed have a desire to end the habit. Again, you won’t feel certain about it all of the time, and we’ll get to that later, but you are definitely showing a desire to get the binge eating out of your life. If you unquestionably believed that you wanted to keep up your behavior, why would you even bother reading this? It’s helpful to see that and then move forward with what you need to do to stop binge eating, instead of overthinking whether or not you really, truly want to recover. Getting stuck in trying to feel completely certain before taking action can be unproductive and delay recovery indefinitely. Binge eating produces harmful, uncomfortable, and shameful effects so that the fundamental and necessary desire to end the habit usually comes naturally. But, what often gets in the way, which I’ll address now, are those moments when you temporarily believe you don’t want to recover. In the moments (or days, or weeks, or even months or years) when you feel like you don’t want to quit, it’s most likely because your lower brain – the part of your brain in charge of maintaining the habit – is driving your thought processes. Because the lower brain senses you need to binge, it will only remind you of positive aspects of your behavior, and point out the reasons why you should continue to do it. A good test to see that the wanting to binge thoughts are from the lower brain is to ask yourself how you feel after a binge. Do you regret it? Do you wish you could go back and make a different choice? Do you feel ashamed of your behavior? If the answer is yes to any of these questions, then it was never you that wanted to binge. If you truly wanted to binge, you wouldn’t have regret afterward; you would simply do it, enjoy it, and move on without being affected much at all. The problem is not that you don’t want to recover, it’s that sometimes the temptation of a binge takes over, and the lower brain temporarily convinces you that you don’t. Nothing is wrong with you because of this. It doesn’t mean you are weak or that you don’t have the ability to quit. It only means the lower brain and it’s motivational machinery and pleasure center are influencing your decisions, and you need to learn to put your higher brain back in charge. In the moments before a binge, you likely experience thoughts that provide logical reasons for binge eating and make it seem appealing. For me, I think the most intriguing reason my lower brain gave me to binge was that it didn’t matter what part of my brain generated the urges, because I wanted to binge nonetheless. That was a challenging reason to separate myself from, because if I slipped back into believing I truly wanted binge eating in my life, acting on the urges would have been soon to follow. That’s why I think it’s so important to be able to dismiss any thought or feeling encouraging binge eating as the neurological junk that it is. This includes those voices that tell you that binge eating is worth it, that it is really you that wants to binge, and that you don’t actually want to recover. The lower brain has been conditioned to react as if the habit is necessary for your survival, and when you don’t do it, it senses that you are threatened. It will use what thoughts have worked in the past to get you to repeat the behavior, and many of these thoughts may make you doubt your desire for recovery. “You don’t know what you’d do without the habit”…”This has been a part of your life for so long, you’d be lost without it”…”You don’t truly want to quit” are just some examples of common lower-brain driven, binge-promoting thoughts. The lower brain won’t remind you of the regret, remorse, guilt, uncomfortable fullness, or the health risks of binge eating (and purging); and trying to think about those things when you are experiencing an urge is usually not effective at deterring your lower brain. Your job is only to experience the tempting thoughts and feelings with detachment and without acting on those thoughts and feelings. After the urge subsides, you’ll again realize that you certainly don’t want to binge, and you’ll remember all of the reasons why; and you’ll be so glad you didn’t temporarily believe your lower brain. Someone asked me a great question recently, which was: “Do you believe in stopping acting on the binge urges before you fully want to recover?” Simply put, yes…because it’s unlikely that anyone pursuing recovery wants to recover 100 percent of the time. Everyone who ends a habit needs to deal with the resistance of the lower brain as it’s re-conditioned, and as I’ve discussed, this causes doubt in your desire to quit during urges. And, because it takes some time for the urges to go away after you stop acting on them, you’ll get plenty of practice disregarding the brain messages that say you don’t want recovery. Just don’t take those brain messages seriously, and you’ll keep returning to feeling like your true self who wants nothing to do with binge eating. This will happen over and over until the urges fade, and when they do, that nagging doubt about your desire for recovery will go away too. One of the implications of this is that you probably won’t fully want to recover (in every moment) until after your binge urges go away. So, ultimately, it’s a matter of taking that leap to stop acting on the urges, and knowing that your desire for recovery will grow as your binge urges fade. For me, the excitement and amazement I felt at finally being able to control my behavior seemed to quickly override those nagging desires to continue doing it. I was able to experience any feeling of not wanting to quit as part of the lower-brain driven habit. I knew that those feelings did not indicate my true feelings, so I didn’t give them attention or significance. So, it wasn’t that I didn’t have doubts pop up from time to time, it’s that I dismissed them when I did. An important thing to remember is that no matter how much you think you want to quit, there are going to be times when binge eating seems appealing. But, you will get stronger and more sure of yourself over time, and with each conquered urge. Your desire to put this habit behind you will start to eclipse any temporary desire to binge, leaving you wondering why you ever thought you wanted it in the first place. What if You Don’t Want to Quit Between Binge Urges? What I’ve described so far is a typical scenario of you truly wanting to recover, but in moments of urges, you temporarily thinking that you don’t. But, what if you feel like this doesn’t apply to you? What if you experience a lack of desire for recovery even when you’re not having an urge to binge? What if you don’t have much regret about your behavior or any real longing to live habit-free? What if, in moments of clarity, you think that continuing to binge makes sense? If this is the case for you, I have three suggestions. First, you could try to take a big leap and quit anyway (try to hear me out on this). Even though you may feel like your true self wants to binge, you could still avoid acting on that desire, knowing that it will eventually fade. No matter how much you want to continue the habit, you still have the ability to control whether or not you perform the voluntary muscle movements it takes to carry out a binge. You can acknowledge your desire to continue binge eating, but tell yourself that it’s simply not in your best interest. Feel sorry for yourself for a while if you need to. It’s hard to realize that we can’t have what we want, whether we are talking about binge eating or other aspects of our lives. It’s human nature to have desires, but those desires can’t always be realized, and shouldn’t always be realized. This might seem like a depressing thought to you, but I believe that once some time goes by, the desire to recover that you didn’t have can appear. You’ll realize how much time and money you wasted by being caught up in the habit, and as the urges fade, you’ll realize that the pleasure you got from it was never worth it anyway. It’s like walking away from a bad relationship even though you truly love the person. It takes courage, strength, and it hurts; but you soon realize you are better off without that person in your life. My second suggestion is to seek outside help – whether that’s coaching, counseling, group support, or some type of therapy – to try to find and grow that desire to recover within yourself. Brain over Binge is intended for people who realize they have a problem and want to recover from it. If you do not feel any pull toward recovery, or if you are complacent in your behavior, then the Brain over Binge approach will not be the right fit, at least until you find that spark of your true self who wants to recover. I’m not talking about “finding your true self” in the sense of becoming emotionally fulfilled or figuring out your life’s purpose prior to stopping binge eating, because that could delay recovery for a very long time. I’m talking about doing what you need to do to catch a glimpse of the part of yourself that wants to move on from this habit. Counseling isn’t the only avenue to help you achieve a desire for recovery. Other things that can help are finding things you enjoy that are incompatible with binge eating, volunteering to help those less fortunate than you, and creating goals for the future so that you can focus your energy toward something other than the habit. To develop a desire for recovery, you have to be open to it, you have find opportunities to see what your life could be like if you were free of your eating disorder. It takes courage to do this even in the face of doubts. My last suggestion is to realize you do have free choice, and embrace whatever choice you decide to make. I would never recommend that someone continue to binge, but I do not agree with labeling someone as diseased or disordered when they are fully deciding to keep up their habit. As Jack Trimpey says in Rational Recovery (when talking about alcohol and drugs): “self-intoxication is a basic freedom, an individual liberty.” (pg. 59). Trimpey’s book takes a more hard-hitting approach toward those who don’t want to quit, which I needed at the time I read it. I needed someone to tell me that I could certainly keep up my behavior if I wanted to, but that I could no longer hide behind a disease label or the idea that I needed to sort out a lot of other problems before I could quit. If I were to continue to binge because I felt like I wanted to, then that would be my choice, and I would have to own it. There were countless eating disorder resources that told me otherwise, that told me it wasn’t a choice, and that I was justified to continue binge eating because it was serving some sort of purpose in my life, or helping me cope with problems, or fulfilling my unmet emotional needs. When I believed those things, it did make me feel a little better about myself for continuing to binge, but it didn’t lead to recovery. Thinking that I was justified to continue my behavior didn’t make the behavior any less harmful. Even though it wasn’t completely my fault that I had developed the binge eating habit, it was my responsibility to end it, even if there were times when I felt like I didn’t want to recover. If you have a desire for recovery and want to stop acting on your urges to binge, you can sign up for my newsletter and updates, and you’ll get my FREE eBook to guide you.